Help you to get a good shape body and toned body. It can reduce the movement damage to a minimum, suitable many kinds of ages people. 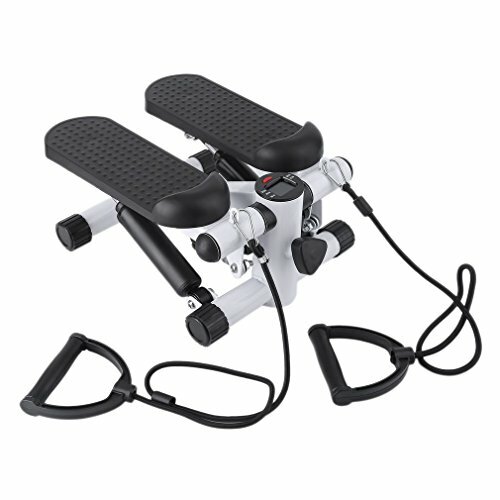 Safe for using cause it has comfortable wide anti-slip pedals. It has measuring the steps, time and calories function. You can use it at home and in gym. Slim legs,lift the hips and perfect for you to do sports. 【Excellent Hydraulic Resistance Design】Stepper adopts excellent hydraulic resistance desgin. It has non-slip pedals to ensure safety, you can feel an obvious resistance of climbing a mountain. In the meanwhile, its buffer and steadiness protect your knees and ankles from getting injuried. 【LCD Screen to Record Calories】The informative LCD training display circularly shows time, scan, rep count, total count and calories burned during your workout. 【Space Saving】The overall size of this stepper saves much more space than a treadmill. Also, its 12.6Lbs weight makes it portable to be taken to anywhere. Its weight capacity is 300Lbs. 【EFFECTIVE MOVEMENT】Move up and down with side to side action to tighten and tone your calves muscles, gluteal muscles and hip flexors.The exercise bands also come with soft foam padded hand grips, which helps you reduce the hand pressure and work out comfortably. If you have any questions about this product by Graspwind, contact us by completing and submitting the form below. If you are looking for a specif part number, please include it with your message.